So it’s post-Christmas, and the dieting time of New Year is on us… and every time I look at that Milk Tray box it reminds me of things I cannot eat. You’d think I’d just throw it out, but see boxes and their bits are so damn handy!! 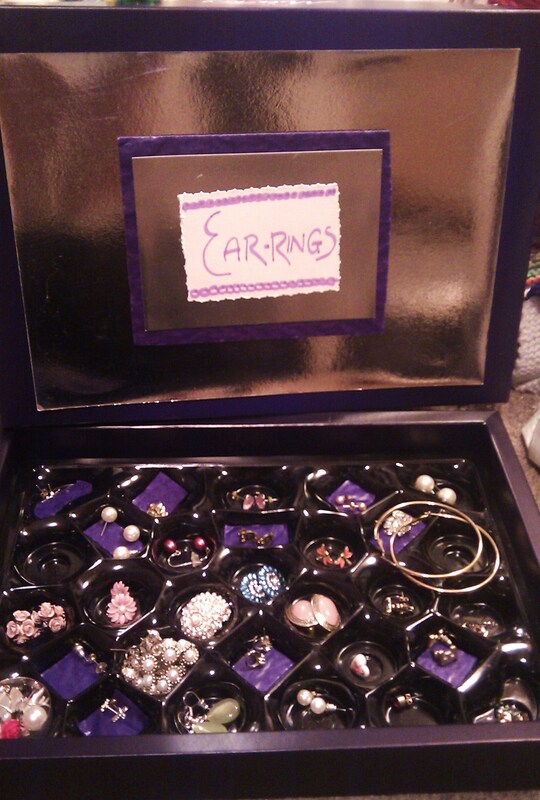 After my most recent Primark trip and 2 more pairs of earrings I decided I needed a more advanced system for my gems. Chocolate boxes are perfect. They come with their own segmented parts for each pair, enough space to spread it all out and the box is easy to store, and looks p. nifty. I’ve just stuck shiny card (a remnant from my Christmas card making the season just gone) and the puffy purple chocolate separator from the inside to layer up and create a better looking (or at least more obvious looking) cover. It makes so much sense that I am shocked I didn’t do it before!